I don’t know a kid of any age that doesn’t like Pizza Senza Crosta, a bit of a cross between fondue, mozzarella sticks, and pizza. 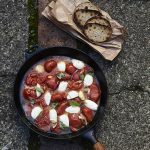 First, you heat rich tomato sauce in a large pot and add big wedges of mozzarella. When the mozzarella starts to melt, it’s time to serve. 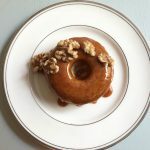 Kelly and David Boudreaux call for a Nature’s Grocer Gluten Free, Dairy Free, Egg Free, Soy Free Plain Doughnut to serve as the base, but you can use your favorite gluten-free doughnut mix (or any doughnut mix) if you’re inclined to bake these at home. A cake-style doughnut will best absorb the rum (you could poke a few holes in the doughnut with a toothpick, like you would for a pound cake glaze). Add coconut flakes over the caramel sauce, if you like (it is dessert, right? ). Feel free to “doctor-up” your “Faith Doughnut” any way you like. Chris Prosperi made this pork tenderloin for us as our pre-show meal, and it was outstanding. 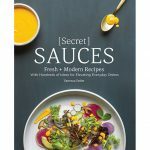 We wholeheartedly recommend you try it for a weeknight dinner or the next time guests come for dinner. Fond of figs? You’re in luck because this recipe is based on fond and figs. Fond is culinary snob speak for the brown bits left over after you roast meat and vegetables. 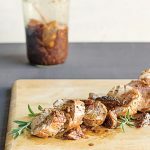 When scraped from the bottom of the pan, the fond (which in French literally means “bottom”) can be incorporated into a sauce, adding a ton of rich depth and caramelized goodness. 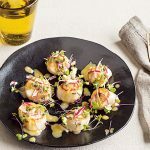 Seared scallops are one of those dishes that qualify has simple and elegant at the same time. They’re easy enough for a weeknight, but special enough for a romantic anniversary or Valentine’s Day dinner. They sear for just 2 minutes on each side, making them quick, too. The other benefit: they’re a blank canvas, begging for a sauce to add interest—or whatever global spin you like.